Adam Sandler infuriates me. He is lazy, he is crass, he is complacent, but more than anything else, he is a good actor. After watching both Punch Drunk Love and now this movie, The Meyerowitz Stories, I can honestly say that Adam Sandler has very clear acting talent. Here in particular he is one of three siblings, the other two played equally well by Ben Stiller and Elizabeth Marvel, who are members of a very dysfunctional family. It's played for laughs several times, but ultimately this movie is an attempt to take a very real look at what it means to be a part of a family that just doesn't want to work. It's very distinct from Sandler's other work, but similar in a way to Punch Drunk Love in that here, a sort of typical character for him is not played as a goofball, or a dork, but as a very real human being, with regrets, hopes, and fears. The entire cast of characters here are characters that might be at home in a different, less sincere movie. The successful half-brother, the eccentric sister, the awkward step-mother, the neglectful father, all of these are archetypes we've seen before. But Baumbach has a way of bringing a realness to his characters that makes them go beyond archetypes, and the actors truly bring them to life. Sandler and Stiller are two stand-out performances, undeniably among the best of both their careers. I've always said that nearly every actor working in Hollywood has the ability to give an incredible performance, sometimes it just takes the right script or director to bring it out of them. Here, we see two actors who are slightly past their prime, their funniest and most famous work decades behind them, who gives soulful, meaningful performances. The way both of them play off of each other and off of Dustin Hoffman is sometimes painfully real, the frustration and anger that their characters have to live with constantly bubbling inside of them, surfacing for only brief moments in ways that are enough to really show the depth that the script imbues onto these characters. Noah Baumbach has always been known for his great dialogue, and here we see it in spades, plus a clear influence from his time working with Greta Gerwig which has only made him into a better filmmaker. 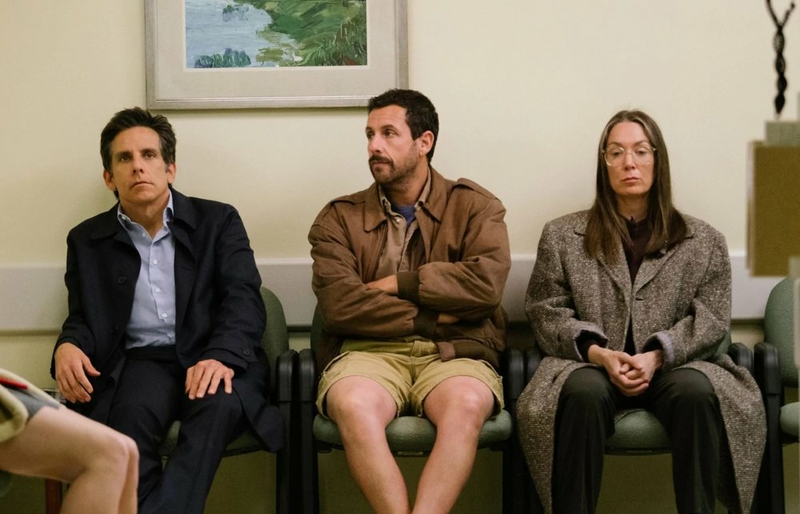 The way that the Meyerowitz family speaks to one another is not only stylish and funny, it's completely based in reality. A frequent issue with them is that they speak over one another, sometimes appearing to be having entirely different conversations with only themselves. It's clear this issue stems from the father, as both sons have particular scenes with him where he's ignoring what they say, despite their almost desperate insistence that he approve or at least acknowledge their lives. Then, when the two half-brothers finally meet up at the hospital, they have an exchange that completely mirrors the way their father talks to each of them, only between the siblings, the disconnect doesn't seem as intentional. They're trying to connect to each other, but they find it very difficult, both because of their different lifestyles, and because that's just the way they were raised. Genuine connection is difficult for them, and when they're all forced together because of a tragedy, it's heartbreakingly funny to watch them attempt to be a real family again. In a way, it's a feel good movie, not because it's sappy or unrealistically happy, but because it's a tale of a family really showing how much they love each other, in their own ridiculous and awkward way. This weird disconnect that the family has with each other is played out in the direction and editing as well. So many of their conversations are shot in such a way where you almost never see the father and son in the frame at the same time. There is both a visual barrier between the two, mimicking the direction of the actual conversation, and sometimes an actual physical barrier. In one particular scene, Stiller's character yells at his Hoffman through a closed car window, as he stares straight forward and pulls away without ever acknowledging what he says. Rarely do any of the characters make eye contact except during very important moments, and even after certain conflicts are resolved, they still aren't the perfect family. These people don't change who they are at their core, but they reach something of an understanding, and the scenes where they are all shown together in the frame are made that much more important, because visually we can see them together, where they did not used to be. Baumbach is experienced at this point, and knows how to communicate visually without needing to explicitly tell anything to the viewer. The visual language of The Meyerowitz Stories is almost as important as the actual words said. He's show us what a real family acts like, a family with years of baggage that still loves each other, so often comes out as behaviors which seem insane to outside onlookers, but are so regular for the family themselves that they don't even notice. The Meyerowitz Stories is an incredibly sincere portrait of the way that children of broken homes look like as adults, and though it has an underlying sadness to it, it's funny and enjoyable enough to watch that I have no doubt it's something that I'll be watching again within the year.